I first moved to Humboldt County in January 2003 to pursue a bachelor's degree in Wildlife from Humboldt State University. Being a birder, I had always wanted to experience Northwestern California and it's bird life, as it was one of the few places that I hadn't yet had the opportunity to bird at in the state. School was the initial reason for moving up here but it quickly became apparent to me that the amazing birding opportunities in Northwestern California were a huge draw and I quickly became one of the areas most active birders. The birding was just so good that I had to constantly get out and experience it firsthand as much as possible! 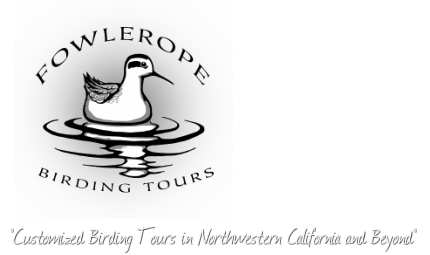 I have always been an active trip leader and I regularly lead field trips for Redwood Region Audubon Society (RRAS), including most of RRAS's-sponsored pelagic trips, Godwit Days Spring Migration Birding Festival, and annual pelagic trips for Mendocino Coast Audubon. I have also led field trips for Western Field Ornithologists and the Central Valley Bird Symposium. When I lived in Monterey, CA, I began organizing the initial bird walks for the local bird and nature store, Wild Bird Haven, and regularly led field trips for Monterey Peninsula Audubon. I am very passionate about birding and love showing people birds and teaching them how to identify them by sight and sound while also informing them about their natural history and ecology. My enthusiasm for birds and birding and sharing my knowledge about them with others is hard for me to contain and there are few pleasures in the world that drive me more. I always find it exciting to find people "lifers" but I also take great pride in showing people just how amazing Northwestern California is for birds and nature in general. Since I have lived in Humboldt County I have become one of the regions most respected birders and also one of the busiest. In addition to birding daily, I am also the sub-regional editor of Humboldt County for the quarterly journal of the ornithological record: North American Birds, the eBird reviewer for Del Norte, Humboldt and Trinity counties, the Field Trip Coordinator for RRAS, and I conduct monthly RRAS-sponsored eBird site surveys at one of my favorite local patches, Shay Park. Hire me to be your professional birding guide during your visit to Northwestern California and experience firsthand my combination of energy, enthusiasm, and intensity coupled with a kind, upbeat, and often humorous and laid back personality. Combine those attributes with my attention to the fine details of logistics like lodging and dining opportunities and we've got the makings for a well organized and exciting tour. If you'd like to see what kind of impression I have left on some of my clients thus far please look at my Client Comments section. Come and join me, and let's go birding in beautiful Northwestern California!